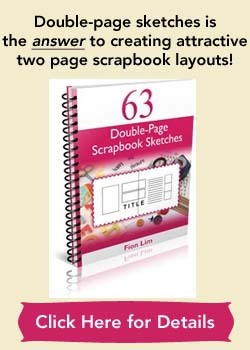 This scrapbooking idea is a light-hearted one. It’s a chance for you to rummage through your piles of less than perfect photos and find one that speaks to you, that evokes some feelings out of you. With many of us owning a digital camera, it’s much easier to get near perfect shots these days. In fact, it’s easy to run into situations of trying to pick the best one out of a bunch of similar-looking photos! But there’ll be times, especially when kids are involved, to have a good shot despite repeated shootings. It can be a failed session, leaving you exasperated with many less than desirable photos. 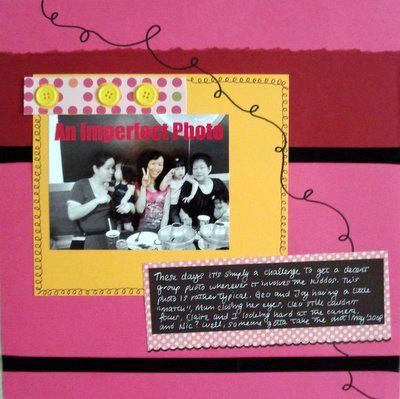 Instead of fretting, why not pick an imperfect photo and scrapbook about it? It could serve as the “thorn among the roses”, one that stands out from the rest and perhaps even paints a few realities for you. 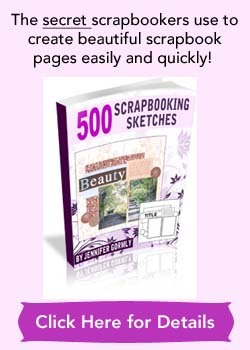 Now it’s your turn to go select a picture to scrapbook about and expose all its flaws in full glory. Describe how you love that picture despite its imperfections! Have fun! Supplies used: Cardstocks – The Paper Company; Patterned papers – DCWV “Nursery Girl Small Pink Dot”, Scrapworks “Morocco Tempo”; Buttons – from stash; Black satin ribbon – Wheel & Anchor; Black Pens – Zig Memory System “Dotta-riffic”, Pilot Drawing Pen; White pen – Uniball- Signo.